My 15 minute project pulls double duty-not only is a an easy and fun tutorial to share with y’all but it’s also going to help me out when I travel to Atlanta later this week for the Haven Conference with all of my favorite home/DIY bloggers. With all those blogging superstars roaming the hotel I’m going prepared with a good 300 business cards to share. 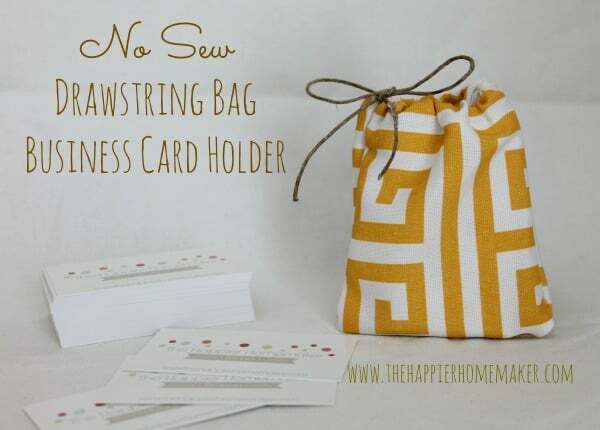 I decided to make a little no sew drawstring bag to hold my backup business cards in my purse! 2. Lift the bottom of the top piece of fabric and place a line of hot glue along the entire seam, pressing together firmly while still hot. 3. Lay your twine or ribbon across the top edge of your fabric about 1/2″ below the top edge. Apply a line of hot glue directly below the twine and fold over the fabric to create a pocket for your twine. 4. Turn over the fabric piece and repeat step three with the other piece, using the same piece of twine. 5. Secure the sides of your pouch using the same method as the bottom, applying a line of hot glue along the edge and pressing firmly together. 6. Flip your pouch inside out and it’s ready to go! 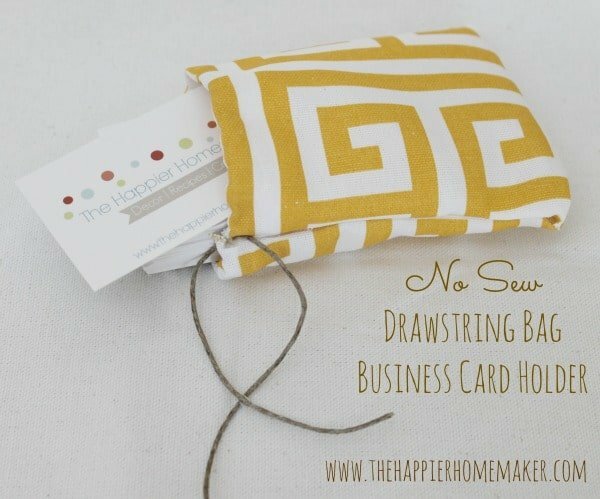 You could use this for anything-it would be perfect for holding jewelry or makeup-but I thought it was just the size for my new business cards! I hope you enjoyed this super easy little tutorial! Be sure to pop over to Craft Lightning on The Country Chic Cottage or 30 Minute Crafts and check out all the other bloggers’ projects all week long! « 100 Cheap Date Ideas! previous post: 100 Cheap Date Ideas! Melissa, this is very cute and I need a super easy first sewing project! Thanks for sharing and hope you are having a happy summer! Pinning! So cute, Melissa!!! I can’t wait to meet you! Super duper cute!!! I’ve been wondering what I’m going to do with my cards at Haven. Too bad I don’t have any cute graphic fabric like that on hand. I’m adding it to my list for tomorrow anyway! Ooh pretty! I can probably scrounge up some pretty fabric in time to make one for myself before Haven. 🙂 Thanks for the idea, I’m pinning this! Super cute and so easy!! Love it!! Pinned it!! present an exclusive combination of different opinion. that is the cute idea and i love it.